Let's face it. Bouncy houses are little kid heaven. 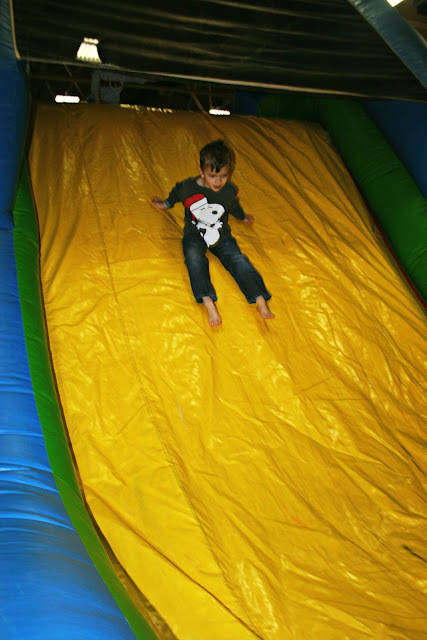 Stick your kid in a bouncy house and walk away and you could come back four hours later to find him still happily jumping and climbing and sliding. But inevitably, there is the germ factor. Moms across the world will nod their head wisely if you ask if their kid ever got the nastiest-virus-ever about 48 hours after an inflatable exposure. You can use the hand sanitizer all you want afterwards, but they're still going to be covered in germs. 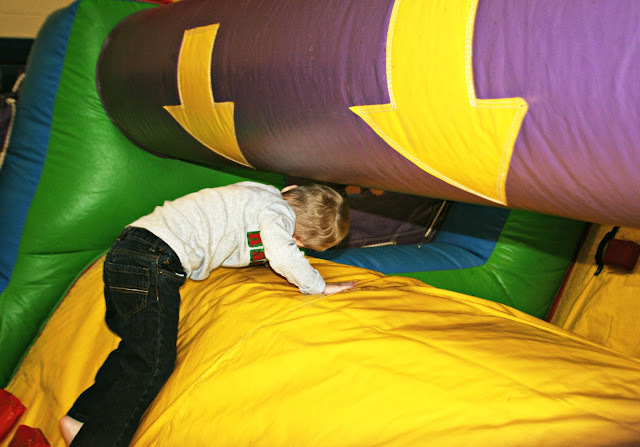 Really, kids should just wear biohazard suits prior to taking off their shoes and socks to go in the bouncy house. It's also problematic when your oldest child gets to go on the bouncy house, but your younger 3 year old twins aren't quite big enough. So you relent and let them go, not wanting them to be in therapy for your "favoritism" in their adult years. And about 2 seconds later one of them will get kicked in the head by his brother and require rescuing. And then the other 3 year old will stay perched up on top of the huge slide for ages, blocking all the other kids and refusing to slide down. So you'll drag yourself through all those holes and cubbies and up the slide, to hold his hand coming down, because that's the sort of parent you are. You are also a parent now totally covered with germs. And the minute you start putting shoes back on the brothers, that same child will sneak off into the bouncy house again only to perch up top and refuse to come down the slide. Again. This time, you'll send older brother in with instructions to "give him a good push" so you can catch him at the bottom. Because maybe you're not as great a parent as you thought you were and all those bouncy house screams have gone to your head. And then that 3 year old? 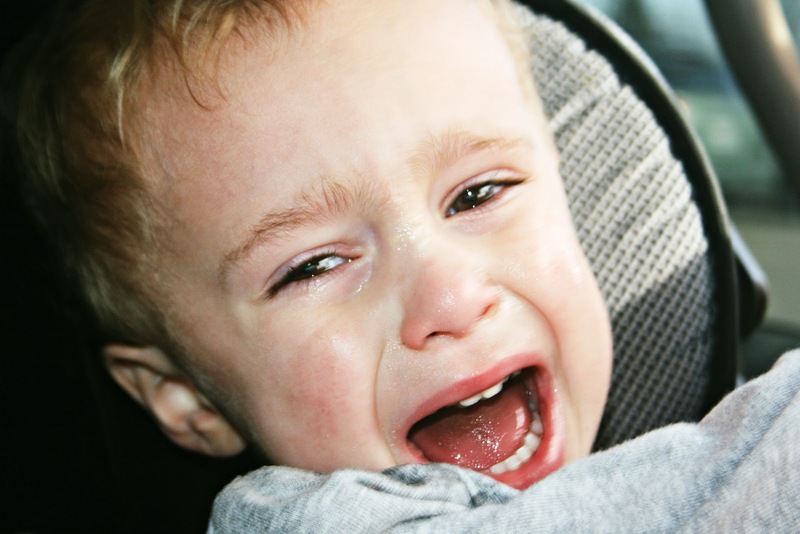 Well he'll have a massive tantrum of rage all the way to the car, bitterly in anguish over his removal from his bouncy house fun. That therapy I mentioned above? Yeah, he'll probably need it anyway. And that, my friends, is the problem with bouncy houses. Just in my humble, and of course completely unbiased opinion. This post was written over a week ago, and scheduled for today. I thought about postponing it a bit in light of what happened on Friday - or even editing it. However, I decided to let it stand as is. Because part of parenting well for me is being able to laugh at my own mistakes, and at the daily ups and downs of parenting itself. But believe me when I say that my thoughts are with the families and their losses in Connecticutt. My hope is that when there are other troubled teens out there who are isolated and considering a destructive path -- then they would receive the effective help and intervention from someone who cares before another tragedy occurs. Those bouncy houses scare me. I remember having to climb in one years ago to get my Granddaughter out. Not easy for an adult to get around in those things. Thankfully the one near us closes the slides periodically to clean them during the day. I would say you hit the nail on the head! I've actually read about child deaths in bouncy houses. Sorry, but had to add this. Not worth it. But they love the activity so. What to do? Well said, Lisa... well said. Oh my I can totally relate to this post! Isaak hates being away from Mica. Mica is a speed demon with those sort of things. Mica dashes ahead, and Isaak sulks because he can't find Mica. You are so right about those bouncy houses!! thanks for a touch of normalcy and letting us giggle a bit. Amy never played in a bouncy house-I can't remember if they were around when she was little, but I do know that the same story could be told about those play structures in fast food restaurants. Amy only got to play on one once, but that was enough! She refused to come down from the very top, and Stuart had to climb up and get her. Not a pretty picture! I'm also adding my thoughts and prayers for the families affected in Friday's tragedy to yours. So very sad. I never thought about the germs in those things, but now that I've read this--I think differently. So? I take it no more bouncy houses. I don't blame you at all, and I feel sure some parents don't think about the germ factor. Oh how funny! I've always hated bouncy houses. A germ factory is all I ever see! That is a problem when they won't come out and you have to go in after them. I see nothing wrong with posting this today, it has been several days since the tragedy. Oh MY! I had not thought about the germs! We take Ella quite a bit, and she has C.F. But we do always carry lots of wipes. The bouncy indoor place here is huge. They have a coy pond and a gift shop, it is real fancy. And tight security, they use bracelets. I adore your pictures!!! 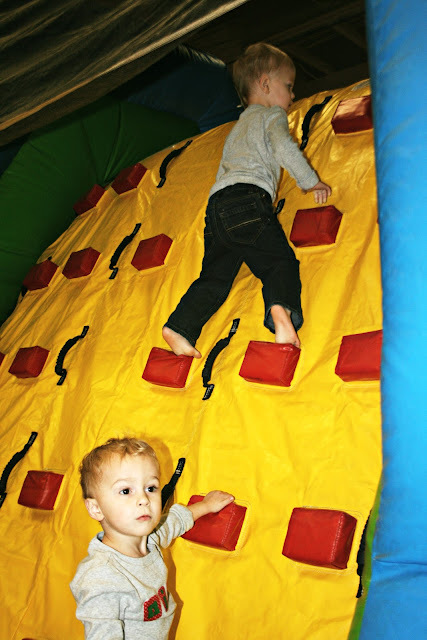 Now here is MY big gripe about the bouncy places!!! Big 12 and 13 year olds running all over the little ones! Kids that old are TOO old for bouncies and just make everyone nervous! Our place has a little corner for kids under three, but that still leaves a lot of other small kids to deal with the pre-teens. I do not know why there is no rule about this! End of rant!! This really made me harken back to my childhood days!! Those bouncy houses are so fun!!! I totally hear you on the GERMS. Those things ick me out big time. You don't have to make excuses for a normal, everyday post. I'm sure each of those parents would give anything to have a day like that with their family. We have to go on...we HAVE to laugh and have good times again...and I pray that they will as families too someday. I can't imagine how they feel today. I needed to see some silly, happy kids today. It is just so sad to think of those who were lost. Thanks for posting about your little ones today. About the events in Connecticut, we are all praying for those families who lost loved ones... AND--you are right. We --as a country-- need to put more emphasis on mental health situations---and help those in need. Thank you for being you--- we are all in this together- and we understand each others hearts. I wouldn't worry too much about the germs; just wash their hands right away. Kids get into germs all the time. On the other hands, I've seen some scary videos of those bouncy houses coming loose from their moorings and blowing over. You may want to check out the reports. Oh, I know that pain of removal from the bouncy house. I feeling it when I cannot shop longer...lol. 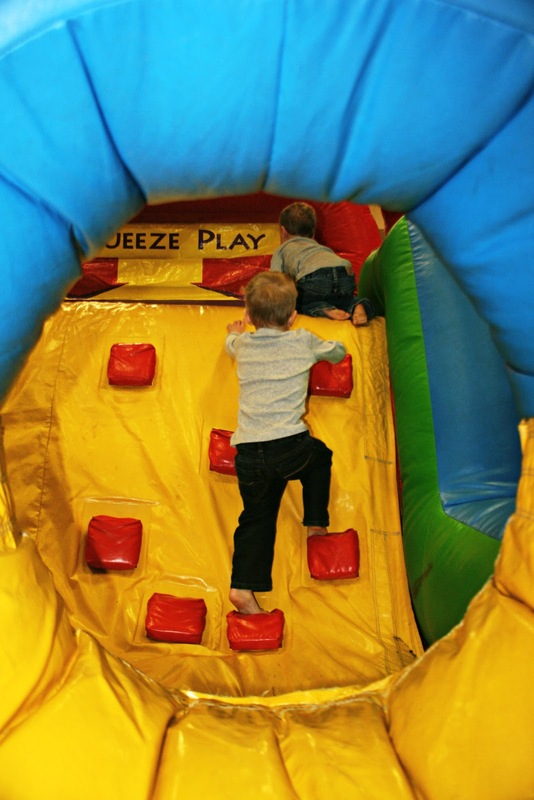 We are long past the day of bouncy houses but I wouldn't let my daughter get in them as they were usually infested with already sick coughing snotty kids. I can imagine the plastic is a good place to grow germs and seldom gets cleaned. May as well plan on a doctor visit after one of those things. Well - it is a bed of germs - but they are so much fun - what can you do. Wash hands for sure. Sorry to chuckle at your post. Too cute. Ewwww...I never thought about all the germs in those things. I have a feeling that in the long run you will have very well adjusted children. They didn't have those when my kids were growing up, they were a little older when they came out. I can only imagine the germs!!! !